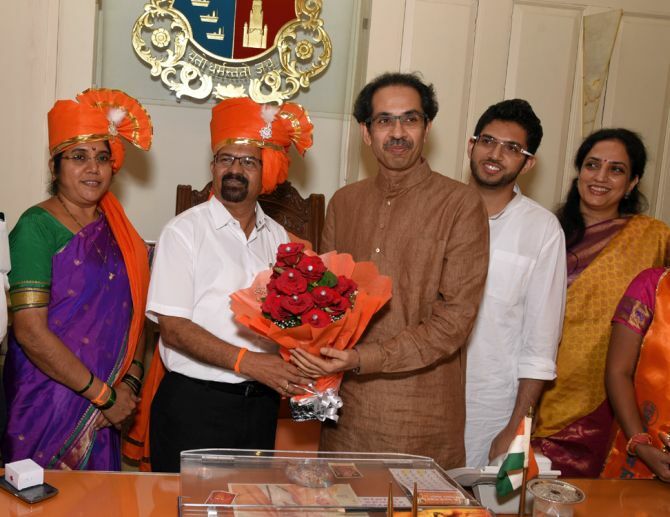 Shiv Sena's Vishwanath Mahadeshwar was on Wednesday elected as the Mayor of Mumbai with the support of the Bharatiya Janata Party, marking a coming together of the two parties after contesting the civic polls separately. Mahadeshwar defeated Congress nominee Vitthal Lokare by 171-31 margin. He is the 76th mayor of the city. The 56-year-old third time corporator has earlier served as chairman of BMC's education committee and was also a member of the standing committee. His election was a foregone conclusion with the BJP last week announcing that it would not contest for the post, despite finishing a close second to the Sena in the bitterly fought polls, which even cast a shadow on the stability of the Devendra Fadnavis ministry. As the House assembled for electing mayor and deputy mayor, BJP corporators, sporting saffron turbans, entered it, chanting "Modi-Modi". Corporators of the Raj Thackeray-led Maharashtra Navnirman Sena did not turn up to the House for the elections. Those from the Nationalist Congress Party and the Samajwadi Party refrained from backing either of the contestants. While 16 corporators remained neutral, eight remained absent and one from All India Majlis-e-Ittehadul Muslimeen abstained from voting though he was present in the House. Shiv Sena nominee Hemangi Worlikar romped home as the deputy Mayor of BMC. In the election, 218 corporators out of total 227 voted. Worlikar bagged 166 votes whereas her opponent and the Congress nominee Vinfred D'souza got just 31. Of remaining 30 votes, five votes were found to be invalid. While 16 corporators remained neutral, eight were absent whereas a AIMIM member abstained though he was present in the city hall. Meanwhile, newly-elected Mayor Mahadeshwar has announced names of members of Standing Committees, Education Committee, Improvement Committee and BEST Committee, which are deliberative wings of the civic body. Shiv Sena president Uddhav Thackreay expressed happiness over the ruling party's gesture of support to get Sena install its Mayor in BMC. However, Thackeray parried a query on whether the BJP-led state government was still on a "notice period". "Our fight against 'Bhampakpana' (hyporcitical agenda) would continue," Thackeray said. In run-up to the bitterly-fought civic polls, including Mumbai, Thackeray had last month said the Fadnavis government was on a notice period, fuelling speculations about its stability as the Sena is an important alliance partner in the NDA dispensation. Thackeray addressed reporters at Hutatma Chowk in South Mumbai after paying tributes to the martyrs of joint Maharashtra movement, along with the newly-elected Mayor and deputy Mayor of BMC. On the BJP corporators voting in favour of Sena nominee Vishwanath Mahadeshwar in the BMC general body meeting, who was elected Mayor, the Sena chief said it was really "pleasing". "We got full mandate in Thane, but fell marginally short in Mumbai (civic polls). But it's good to have got their (the BJP's) support in Mumbai," he said. Thackeray also thanked the BJP government for the progress it had made in implementing the Bal Thackeray memorial project. "Whatever right is right and we must accept it. I appreciate the state government for moving forward in the right direction in setting up the memorial," he said. In a hung verdict in the 227-member BMC, Sena had won 84 seats while the BJP 82. The next largest bloc in the civic body was Congress (31). However, due to rupture in their alliance ahead of the civic polls last month, the Sena and BJP couldn't secure any understanding in the BMC until Chief Minister Devendra Fadnavis announced that BJP would not contest the Mayoral poll or lay claim to crucial committees in the civic body. Thackeray, however, evaded queries on the formation of alliances in Zilla Parishads, which went to polls last month, where the BJP has done well. The relations between the BJP and the Sena, partners in the state and central government, hit a new low during the campaign for civic elections across Maharashtra, which saw them hurling charges at each other. The Sena had even threatened of pulling out of the BJP-led government in the state anytime. The BJP put up a splendid performance in all parts of the state and shook Sena's citadel Mumbai, its political heartland land right from its formation in the 1960s.